In June 2017, the Mandarin Museum opened A Soldier’s Story, a long-term exhibit commemorating the entry of the United States into World War I. 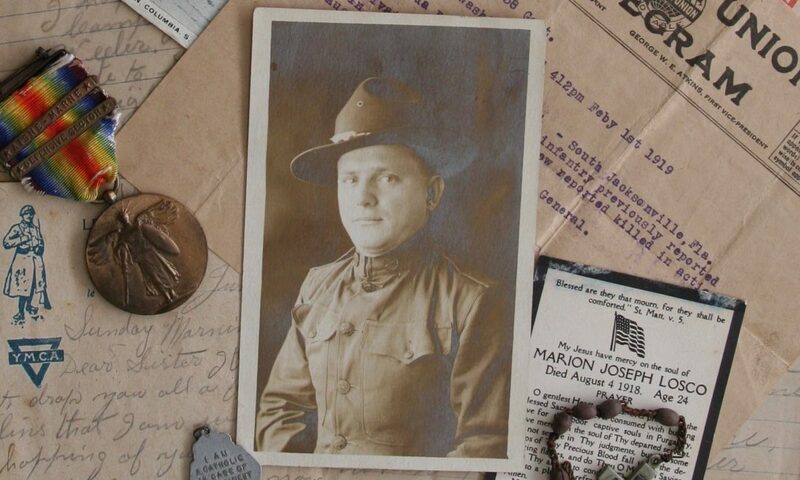 The exhibit honors one of Mandarin’s own, Marion Joseph Losco, who served in France and whose parents owned the winery that now resides in the Walter Jones Historical Park. “DO NOT FORGET THAT THIS IS REGISTRATION DAY,” blared the headlines of the Florida Times–Union on June 5, 1917. All across the country every male citizen was required to register for the military draft for World War I at his local voting precinct on this date. In the Mandarin section of southern Duval County, the registrants went to the Precinct 30, the Walter Jones Store and Post Office. Marion Losco, son of Frank and Dometilla (Danese) Losco of Mandarin, was a 23-year-old farmer when America entered the “war to end all wars.” He registered for the draft as required, went to South Carolina for boot camp, was shipped to France, and died on the battlefield in France two weeks after his 25th birthday in 1918. This scenario was repeated many thousands of times as America sent over two million men to fight. The exhibit features Losco’s wartime letters to his mother and other personal objects, as well as an authentic full uniform and general WWI artifacts. In conjunction with the exhibition, Mandarin Museum & Historical Society published a new book, also entitled A Soldier’s Story. The book includes Losco’s letters and Army correspondence, personal and historical photographs, and historical research by the book’s editor, Paul Ghiotto, a MMHS volunteer and former Director of the Jacksonville Maritime Heritage Center. Al Poindexter performs his original song about Marion Losco at a Mandarin Museum and Historical Society event marking the the 100th anniversary of Armistice Day.